Hauskaa lauantaita, tervetuloa Allsorts haasteen pariin! Aiheena kevään kukat tai kevätsateet! Kevään kukkana helmihyasintti ja tein kolme erilaista korttia, simppelin, peruskortin ja runsaasti koristellun. Kerro mielipiteesi, mikä sinusta on kaunein? Hi; Happy Saturday, it's time for a new Allsorts Challenge! Spring Flowers and/or Spring Showers is the theme of lovely DT Ellie this week. My favourite spring flower is grape hyasinth, I have them a lot in my cottage garden. coloured a little with brush and DIs. Then stencilled the brick wall with DI (vintage photo). Card size 5"x7", easy to post, golden embossing on the edges, frame Spellbinders diecut. 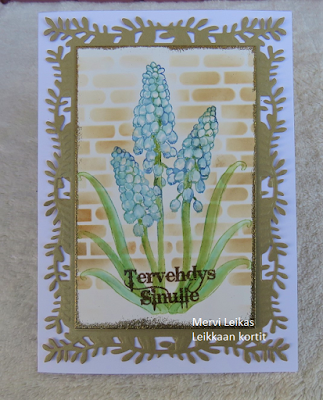 Card 3. More is more, lots of layers! 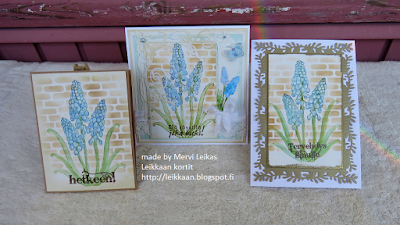 Card size 6"x6" square, 7 layers, coloured watercolour papers, one dry embossed with hearts. Lace, seam binding ribbon and bow, pearls, swirl corner diecut Sizzix, grape hyasinths Marianne Design's and butterfly and shaped one Crafter's companion. Sentiment "live full at all times..."
So, what is your favourite? Have a Happy weekend! Sun is shining here, lovely spring day coming! Leikkaan kortit 10 vuotta - Cards and Crafts 2008 - 2018, 10 years celebration year! Leave a comment, there's surprises drawn every month until to September. Jättämällä kommentin osallistut yllätysten arvontaan aina syyskuulle asti! Grape Hyacinths are indeed a lovely cottage garden flower Mervi and each of your cards very pretty. I don't think we have any now, they all seems to have disappeared. Kiva idea tehdä kolme erilaista korttia samalla kuvalla. Suosikkini on näistä tuo kolmas. Kauniita kaikki. Eniten minua miellytti kortti, jossa oli ruskea koristeellinen kehys. What a lovely card!!! Love he pretty flower image!! Thanks for joining us at “Simply Create Too”. More of my favorite spring flowers, I really should plant some of them! 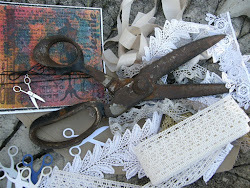 Such a beautiful assortment of cards, so perfect for my theme this week! Beautiful projects. Thanks for joining us at Moving along with the times. This is gorgeous! Thank you so much for sharing this with us at Creative Inspirations. Good luck! 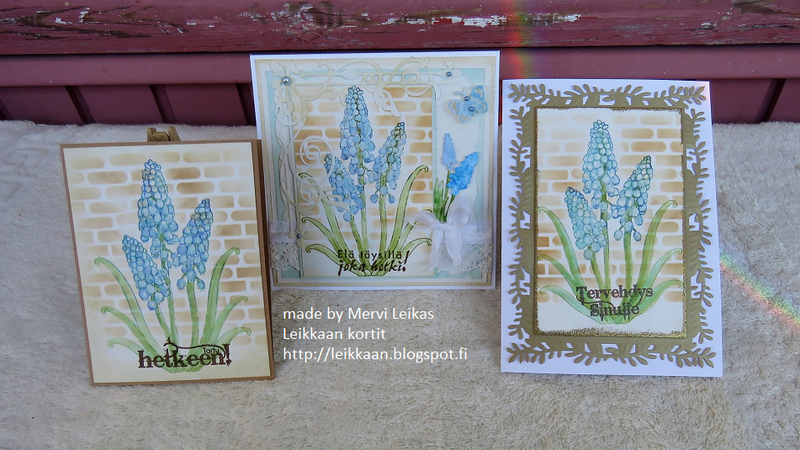 Three gorgeous creations Mervi, love that stamp and all three designs with the wall background look brilliant. Hello… Thanks for sharing your lovely project with Moving Along with the Times Challenge Blog; it fits perfectly with our ‘Springtime’ challenge theme. Hope you can join us again very soon. Kauniita ovat kaikki, eniten tykkään kolmannesta. Ihana kukkaleimasin ja sopii tosiaan monen tyylisiin kortteihin. Tiilitausta on tosi kaunis ja valitsemasi värimaailma on ihanan harmoninen! Kiitos kun osallistuit Time Out haasteeseen! 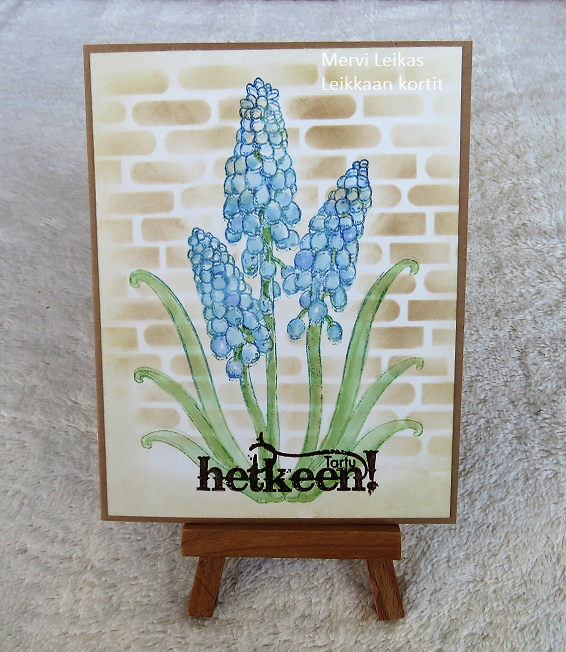 Three very gorgeous creations Mervi, I love hyacinths such a beautiful fragrance from them. Love these so much!! I used to play with these flowers when I was a little girl, if you push the flowers off with your hand in the opposite direction, they pop off everywhere. I used to get in trouble but it was so worth it! Your colouring skills are incredible, the flowers look so real and love how each card is different but you've kept the same colours. So glad you shared these with us at TIME OUT! You have made a beautiful selection of cards colouring in with distress inks. They fit perfectly the Colour Crazy Challenge this week. Thank you for entering and best wishes in the draw. Kym (Colour Crazy Challenge Design Team Member). 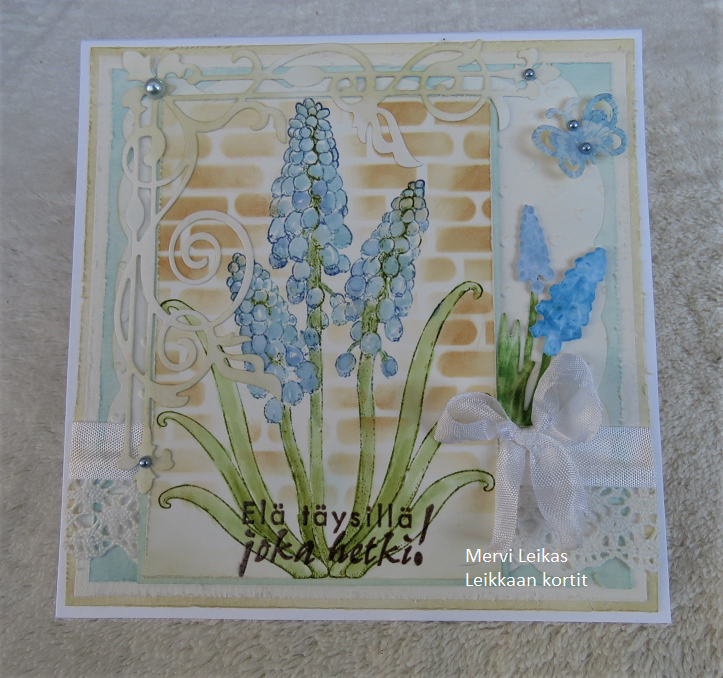 These are beautiful flowers and a versatile stamp for many occasions. Your cards are similar and yet so different, there’s one for any taste of style. kaikki kauniita en osaa valita 1 ja 3 miellyttää miuta .ääh..en pysty yhtä sanomaan.